Hello! Sorry for the long absence. It was a busy autumn with trips to northern Massachusetts, New Hampshire, and Rhode Island to shoot foliage. Then came a business trip to San Diego. Then Thanksgiving with the snow, and next blog post I’ll share some of the photos I took there of an endangered place in the Catskills. But for now let’s do a “show and tell” of Woodstock. I drove up there yesterday to have lunch, enjoy a play, and generally walk around enjoying the decorations. Here goes. 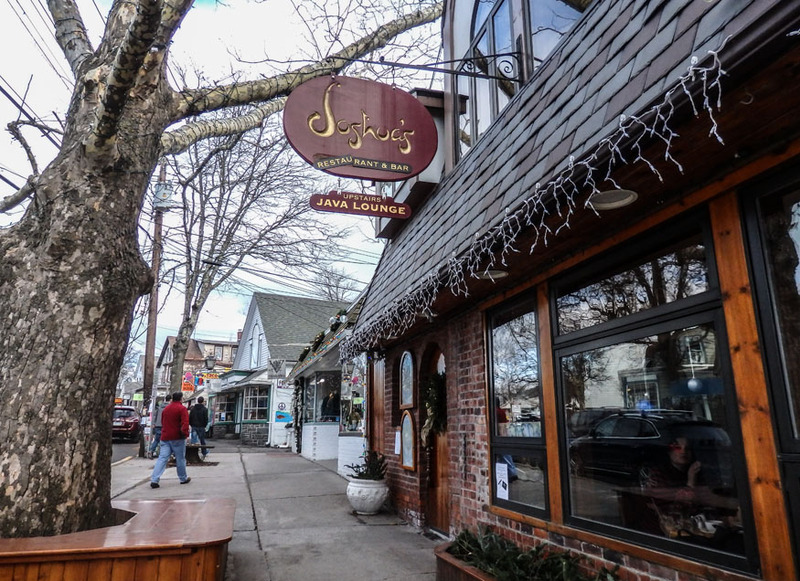 First, I had a fabulous lunch at Joshua’s and can highly recommend this place — the food, service, and ambience. not to mention the prices! The menu has a strong international flavor, with a number of Middle Eastern dishes. 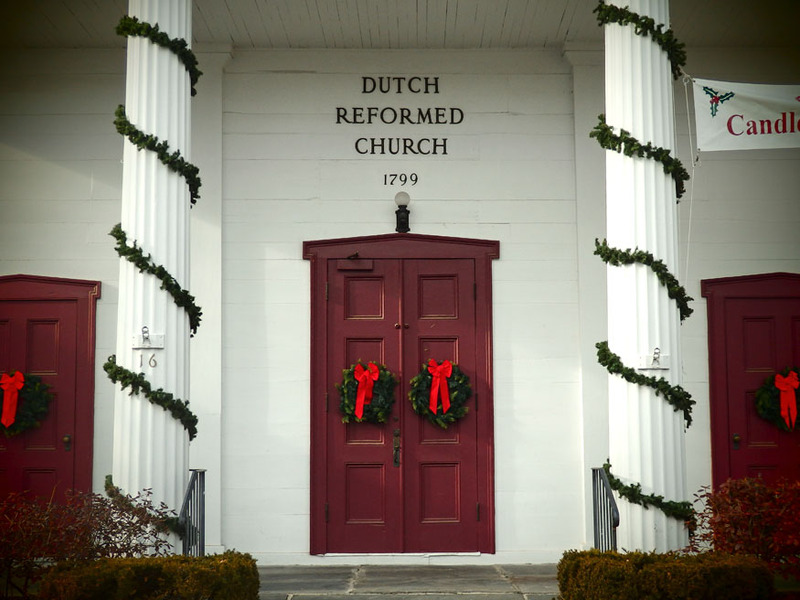 Here’s the front portal of the historic Dutch Reformed Church, all decked out in Christmas finery. The Rare Bear gift shop looks warm and inviting to potential shoppers. Also, notice the historic marker to the left. Food for thought! Here the emphasis is on the historic marker itself rather than on the building. A call to support your local, homegrown businesses, please. 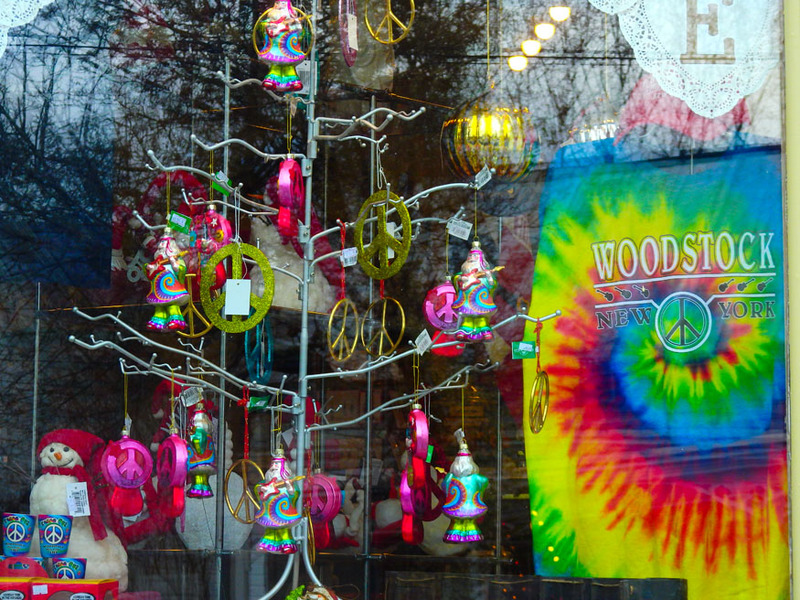 It may be Christmas, but Woodstock will never let you forget this is Woodstock! Still, when you look at the decorations on display in this shop window, it’s kind of fitting that the birthday of the Prince of Peace is being celebrated. Finally, about that play I mentioned. They preferred not to have pictures taken during the performance, and I respected that. But I do encourage you to go and see it for yourself, if you can make it to Woodstock this coming weekend. It’s The Trial of Ebenezer Scrooge: A Holiday Comedy by Mark Brown and performed by the Bird-on-a-Cliff Theatre Company. It’s funny, it’s not without its commentary on some foibles of modern society, a delight for everyone familiar with Dickens’ A Christmas Carol, and very well acted by a professional cast. 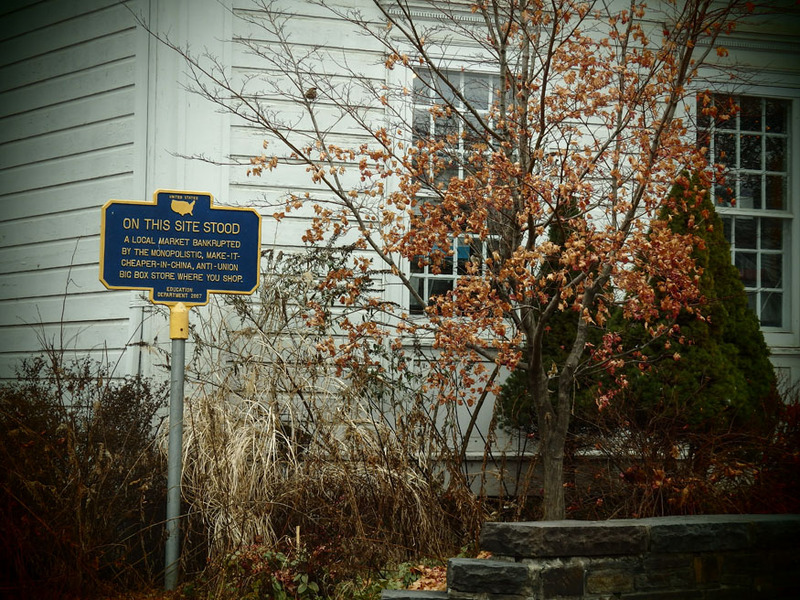 More performances this weekend December 19-21, appropriately enough in the court room of the Woodstock Town Hall. See http://birdonacliff.org. If you’re still looking for holiday gifts, or would like to treat yourself to something, please have a look at my Etsy shop for some irresistible specials. My Ashokan Items gallery has some photo prints of obvious local interest at a special sale price plus free shipping (USA only), and my Special Sale Items gallery has a selection of some of my best photos, already matted and framed, at ridiculously reduced prices, mostly left over from summer and fall shows because I need to clear some space around here. These are special prices for you faithful readers of my blog. 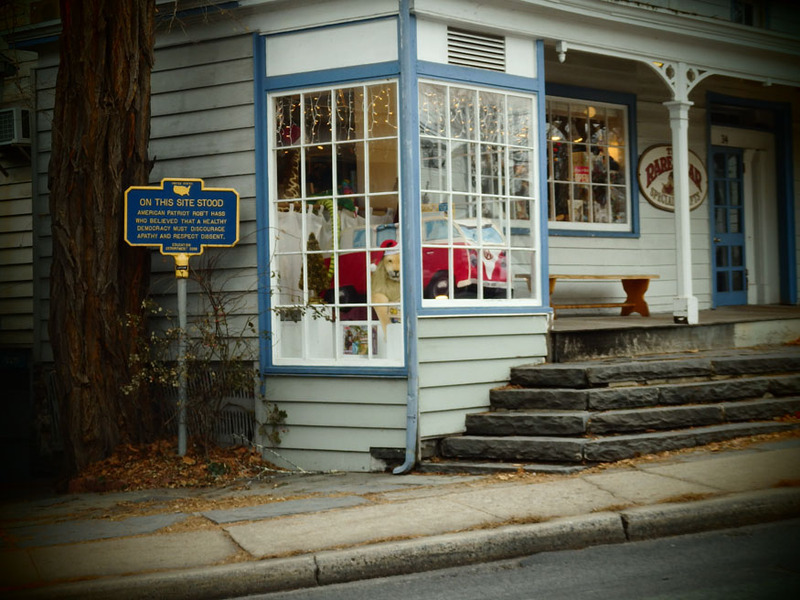 Here is another mini-collection of photos of Hudson Valley towns decked out for the holidays. This time it’s Cold Spring in Putnam County. The reflection of the decorated shops across the street in the window of one of Cold Spring’s wonderful antique shops gives a “two-for-the-price-of-one” image. This cheerful snowman greets passersby outside my favorite Cold Spring cafe. One of Cold Spring’s premier restaurants boasts not only a river view, as its name indicates, but also a stunning view of Storm King Mountain, as you can see, on the other side of the Hudson.